That’s just one reason I don’t have a pickup truck. Still, those of us without trucks often have to carry something long or bulky. 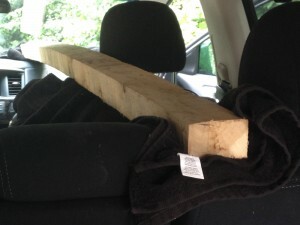 And that item is likely to have to rest on your dashboard, upholstery or both. For that reason I carry three bath towels in my van. These are nice, thick towels to provide plenty of cushioning protection. When I need to carry a long board in my car I don’t want the dash scratched or treated-pine juice soaking into the upholstery. At the discount store they are only a few dollars each, but provide invaluable protection. The cheapest bath towel at the dollar store works just fine. 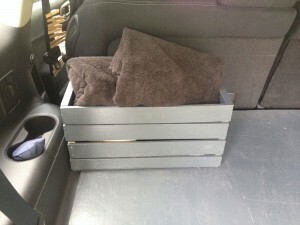 Tuck them into out-of-the-way spaces like the spare tire well. For my car, three towels are sufficient: dash, front seat, rear seat. 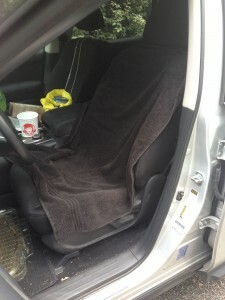 Not only will they cushion your load and protect your vehicle from scratches, they are terrific seat covers when you’re dirty or sweaty or both. The only thing worse than being unable to clean the dirt out of your car’s upholstery is putting up with the sour smell because you sweated right down to the core of the driver’s seat. Protect the seat with one, or two or all three of your transport towels, depending on how sweaty you get.